The Light Station has been continuously staffed 24 hours a day since 1994 by Association members who serve as volunteer Keepers at their own expense, while serving one-week shifts. The Association membership has grown to almost 800 family units, composed of approximately 1,900 individuals. If you are not an Association member, and want the opportunity to volunteer as a Keeper, visit our Membership page. The Keeper's Quarters has three main bedrooms, two with queen size beds and one with a queen and a twin. 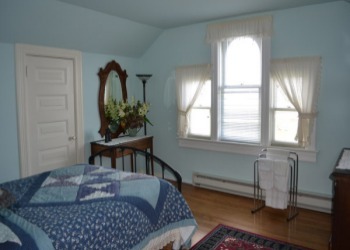 There is also a bedroom in the basement with two twin beds. Maximum capacity is 7 people. A fully equipped kitchen, dining room, living room, and two bathrooms complete the living area of the house. A recreation room with a pool/ping pong table, laundry facilities and storage are located in the basement. Two or three couples (or some combination of 4-6 adults and children) serve as Keepers each week. Children must be six (6) years of age or older. Only current members of the New Dungeness Light Station Association are eligible to be Keepers. Grandparents can stay with their grandchildren without the children's parents being current members. Keepers perform maintenance duties at the Light Station including watering, mowing and trimming the lawn. They also give tours and provide historical information to the visiting public. 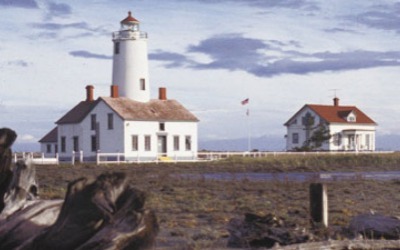 The New Dungeness Lighthouse was the first lighthouse completed in Washington Territory. It has operated continuously providing navigational aids to ships plying the waters of the Strait of Juan de Fuca since its lard oil lamp was lit for the first time on 14 December 1857. Originally, there were two full-time Keepers who lived in the Lighthouse. In 1904 a dwelling for the Officer-in-Charge was constructed east of the Lighthouse. Today this dwelling is known as the Keeper's Quarters. In 1927, because of deterioration, possibly caused by the North Cascades earthquake that occurred in 1872, the 91-foot tower was reduced to its present 63 feet. A well drilled in 1930 provides excellent quality water. An armored marine cable laid across Dungeness Bay in 1934 brought electricity to the Light Station. In 1976, the light and fog signal were automated and the Station was manned by a single Keeper. In 1993, it was added to the National Register of Historic Places. Due to budget cuts, in 1994 the U.S. Coast Guard withdrew its last Keeper. Plans were made to board up the buildings. Unattended light stations often experience general deterioration and vandalism. 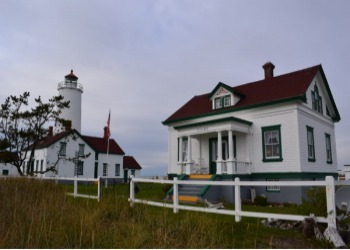 However, the New Dungeness Light Station Association was organized in 1994 with the mission of protecting and preserving the Station. It obtained a renewable license with the U.S. Coast Guard. The Association's goals state that "The New Dungeness Light Station will be the finest example of historic restoration, preservation and interpretation in the Nation". The Association instituted a rigorous maintenance program, stabilized physically declining structures, replaced fatigued equipment, and upgraded systems. The safety and security of the property has been vastly improved with regular safety audits, emergency protocols, communication equipment, first aid supplies and fire equipment. All costs for maintenance and renovation of the Lighthouse, Keeper's Quarters and outbuildings are provided by the Association through dues, donations and Keeper's fees. Membership in the Association furthers the mission of preserving and restoring the site. Members have the unique opportunity to become Keepers and live the life of a Keeper for a week, being responsible for the operation of the Lighthouse in much the same isolation as Keepers of the Nineteenth Century. Each week, up to six volunteer Keepers who have paid a weekly fee, planned their meals and purchased their food are transported to the Station. During the week, they perform minor maintenance and repairs to the buildings and mow, trim and water the lawn. They serve as tour guides providing historical information to visitors who have hiked the 5 miles at low tide or arrived in kayaks. The tour includes a trip to the top of the tower to enjoy the panoramic view. Keepers have greeted approximately 80,000 visitors since 1994. The Association has developed an Interpretive Center in the Lighthouse to inform visitors about the historic and present significance of the Light Station. Two rooms in the original Lighthouse that were used as a Sitting Room and an Office have been restored with furnishings appropriate for a 1930s timeframe. These rooms display a timeline of Keepers and as well as photos and artifacts relevant to life at the Station. The Association works with the U.S. Coast Guard, which maintains the lantern, and the U.S. Fish and Wildlife Service. It has the support of the Jamestown S'Klallam Tribe, Clallam County Sheriff's Department, Clallam County Fire District No. 3, Sequim Chamber of Commerce, and local leaders.